The Sunday Game could look very different ten or twenty years from now. The VAR or Video Assistant Referee monitor. The way we live is changing fast. Every fortnight in our Future Focus series, supported by Volkswagen, we’ll look at how one aspect of everyday life could change in the coming years. This week: sports. ATHLETICS, GAELIC FOOTBALL, rugby – yeah, they’re great, but what about drone racing? Robotic car rallies? Or genetically enhanced superhuman sports leagues? The future of sports looks set to be pretty intense. Whether it’s gene-edited athletes, advances in referee technology or lasers – yes, lasers – technology will be playing a part in everything from the stadiums to the sliotars. This summer we saw the FIFA World Cup setting precedents for soccer and other sports too. Russia 2018 was the first World Cup to use a video assistant referee to offer corrections to the on-pitch referees. Although there were a few teething issues with referees unable to make contact with the video ref during some matches due to technical issues, the technology was deemed successful overall. 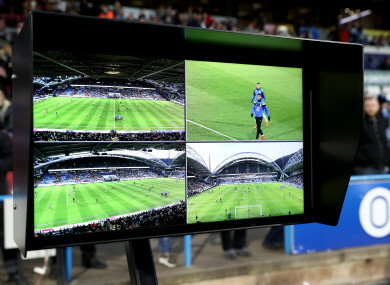 Yes, the VAR monitor is currently operated a human, but most likely, the system will continue to be used and enhanced – potentially until human referees are replaced altogether. Waiting on a Video Assistant Referee decision for a penalty during Saudi Arabia V Egypt at Russia 2018. Newry-based company STATSports provided both English and Belgian players – as well as teams such as Brazil, Germany, Portugal, Poland, Denmark and Morocco – with its APEX Team Series GPS device throughout the World Cup. The device tracks over 50 metrics, including average metabolic power, fatigue, stress load and impact on left and right side. STATSports are going from strength to strength across plenty of other sports too, with data tracking set to become a much more intrinsic part of developing game tactics moving forward. Right now, Fujitsu and the International Gymnastics Association are partnering to build 3-D laser sensors which gather data on gymnasts’ performances. The system is due to be completed in time for the Tokyo 2020 Olympics, and it will help judges to analyse and score the performances more accurately, potentially eliminating bias. Although the system will operate as an assistant to the judges in 2020 rather than sole judge, the prospect of fully-AI scoring and judging panels might not be far behind. There are countless other sports trackers currently available, such as BoB motion capture technology to help tennis players improve their technique and PIQ Sport Intelligence’s GAIA platform for tracking performance in sports such as boxing, skiing and kite boarding. It’s not just your ski-jumping ability or your punching speed that’ll feed data collection going forward – there are also highly personalised gene-based forms of data collection in the pipeline which could help to improve your game. For instance, the RugbyGene project is aiming to identify the genetic underpinnings of elite rugby athlete performance and sports injury. By knowing exactly what genetic sequence makes a rugby player a top class rugby player, we may be able to use gene-testing to single out potential high performers before they ever set foot on a pitch. But if you don’t have the genes naturally, there’s always editing. Today, gene editing is nearly at the point where it could potentially be used by athletes, but the developments have already caught the attention of WADA, the World Anti-Doping Agency, who this year added “gene editing agents” to its list of banned substances. The CRISPR gene editing technique can be used to remove cells from the body, edit them, and put them back in. China has already begun human trials, and trials in Europe are due to begin towards the end of 2018. At the moment these are focussed on curing disease, but will likely also have a huge impact on sport as athletes could be “created” rather than born. This could also affect our understanding of athletes and sports in general. Today, some performance enhancers which are injected (such as erythropoietin) can be discovered through blood and urine tests. But if erythropoietin is being created by the cells themselves through gene therapy, it’s difficult to detect – which may cause problems when it comes to drug testing ahead of sporting events. It’s possible that performance enhancement will become a lot more common, and a lot harder to control. A Future of Sports report by FutureOf.org in 2016 even went so far as to predict that there will be separate leagues for “natural” and “enhanced” athletes, while safe and detectable performance enhancement drugs will be legalised to certain levels in sport. Supplements on the other hand may give athletes a legal edge. Researchers at DCU have found a supplement known as a ketone ester which could help fatigued players to make better decisions. Decision-making in players has been shown to disimprove as a game progresses – but in a study of 11 players, this disimprovement did not take place in athletes who had taken ketone supplements. All in all, the coming years in sports are likely to be busy ones. While athletes and sportspeople change, so too will the sports themselves. Drone racing already exists and the Drone Racing League is broadcast in 75 countries. As self-driving cars become mainstream in day to day life, Formula 1 racing could become more niche. And although the world was amazed when a computer beat the chess world champion back in 1997, today Japanese volleyball teams are training against a robot programmed to mimic players’ tactics and figure out how to beat them. Forget the World Cup, how about a Humans Vs Robots Superleague? Email “Robot referees and genetically engineered 'super athletes': Here's the future of sport”. Feedback on “Robot referees and genetically engineered 'super athletes': Here's the future of sport”.